2018 is history, and that means it’s time for public libraries to get ready to document their performance measures in the Minnesota Public Library Annual Report. The LibPAS online survey tool opens February 1, 2019. If you are a new filer or an experienced filer who appreciates a refresher, please join us during a webinar on Wednesday, January 16, 1-2 p.m., to learn about new indicators, modifications to current indicators and how to enter data into the online survey tool. When it's time, join the meeting via WebEx. Registration is not required. If you have any questions or concerns, please contact Joe Manion (651-582-8640). Due to technical difficulties, connections to the Dec. 18 Prepare + Prosper webinar may have been problematic. If you tried to attend, but had difficulty connecting, please contact Emily Kissane (651-582-8508) for a recording and the presentation slides. The Minnesota Department of Education is committed to supporting the state’s Heading Home Together plan, and library staff training is one of our goals. All library administrators, staff, board members, and volunteers now have free year-long access to “Practical Tips for Homeless Patrons,” an online, self-paced tutorial presented by Ryan Dowd, the author of “The Librarian’s Guide to Homelessness.” Through the course, participants will gain insights into the mind of a person experiencing homelessness—how they might communicate, likely experiences that color their worldview, and possible triggers to behavior escalation. Through an empathy lens, library staff and volunteers will also gain tips and tricks for welcoming, serving and supporting homeless patrons. To take the training, follow the enrollment steps on the Niche Academy website. Contact Jen Verbrugge (651-582-8356 ) if you have access issues or other questions. Ignite Afterschool’s third biennial conference, Believe it. Build it. The Conference Edition, in April will offer a variety of sessions, trainings, and more featuring the following themes: Workforce, Youth Employment, and STEM; Social-Emotional-Learning (SEL); and Health & Wellness. Ignite is now seeking session proposals that align with one of the three conference tracks and/or with one of the six afterschool effective practice building blocks in Believe It. Build It. Learn more and submit your session proposal soon; the deadline is January 21, 2019. If you are interested in exhibiting, advertising, or sponsoring the conference, contact Matt Ramirez for more information. Public libraries can apply to be part of a national tour for the traveling exhibit, Thinking Money for Kids. The exhibit strives to teach children ages 7-11 and their parents, caregivers, and educators about financial literacy topics—including saving, spending, and budgeting—in a way that is understandable and fun. 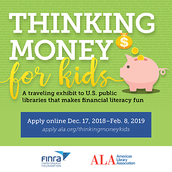 Thinking Money for Kids is a museum-quality exhibit that will travel to 50 U.S. public libraries between 2019 and 2021 by the FINRA Investor Education Foundation and the American Library Association (ALA) Public Programs Office. Applications are due February 8, 2019. The Institute of Museum and Library Services has launched a new special initiative, Accelerating Promising Practices for Small Libraries (APP), and is accepting grant applications now through February 25, 2019. This funding opportunity is designed specifically to strengthen the ability of small and rural libraries, archives, and related organizations to serve their communities. Awards sizes range from $10,000 to $50,000, and there are three grant categories: Transforming School Library Practice, Community Memory, and Digital Inclusion. For more details, please read the notice of funding opportunity and attend an informational webinar on Wednesday, January 9, 1-2 p.m. (CST). Recordings of the informational webinars will also be made available on the IMLS website. For information about how to participate in the webinar or to access the webinar recordings, see the IMLS webinar page. Teachers, students, parents, and scientists take center stage as NOVA explores a new vision for the “School of the Future.” The documentary takes a close look at some of the people, programs, and ideas creating a new vision of education for all children and leading the way to the school of the future. NOVA will send out free screening kits (in English or Spanish) with a DVD copy of “School of the Future” to schools and community organizations that would like to host a screening. If you are interested in screening the film at your school or organization, please sign up through the PBS website. Please contact Gina Varamo with any questions.